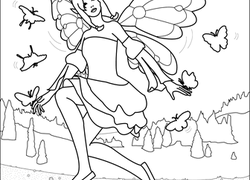 Fairies coloring pages help your child colour an enchanting and delicate fairy. Your child can use these fairy coloring pages and worksheets to create a colorful fairy straight out of his imagination. 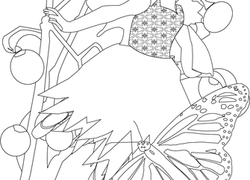 There are a tonne of fairies to choose from in these coloring pages, from traditional fairies to sports fairies, and from fruit fairies to swamp fairies. 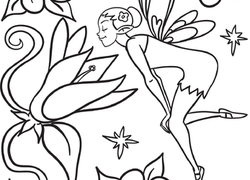 Bring some magic to your child's coloring with these fairies coloring pages. Would your first grader rather colour fairies than do her maths? With this worksheet, she can do both! This fairy practise sheet focuses on two-digit addition. Is your first grader more interested in fairies than maths? Help her learn her doubles facts with this fun fairy addition worksheet. Have you ever seen a flower fairy before? Here's your chance! Give your child's imagination a boost with this pretty coloring page. Does your first grader need help with two-digit addition? This colorful fairy-filled worksheet is a great way to give her the practise she needs. 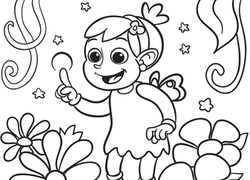 This double-whammy of a coloring page combines two classic kids' favorites: princesses and fairies. This adorable coloring page features a sleeping child and the real live tooth fairy! Your kid will love getting a sneak peek. Sure to get your first grader in the St. Patrick's Day spirit, this scene filled with fairy friends is just begging for his attention! Does your first grader need a little incentive to practise single-digit addition? This fairy-themed printable might do the trick! This ballerina fairy coloring page features this beautiful and fortunate creatureâimagine dancing without ever having to put your feet on the stage! Little pixies will love coloring in this fairy queen and her royal dress. Draw in her face to complete the picture! Colour this magical picture with any colour your imagination can come up with! Buzzzzz! There are no limits when it comes to the world of fantasy. Activate your child's imagination by having her colour an adorable bumble bee fairy. 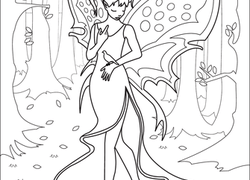 Colour this fairy in to bring yourself a little closer to nature.